Marist School, one of the oldest Catholic school for boys in Marikina, recently released their newly revamped version of their Official website at http://www.maristschool.edu.ph. The site includes a list of admission policies, requirements, enrollment procedures & schedules, payment fees & schedules and other pertinent information about the school. Marist School is located at 50 Champagnat Avenue, Marikina Heights, Marikina. Before Bayani Fernando became MMDA Chairman and eventually ran for Philippine Vice-President, he served as Mayor of Marikina from 1992 to 2001. 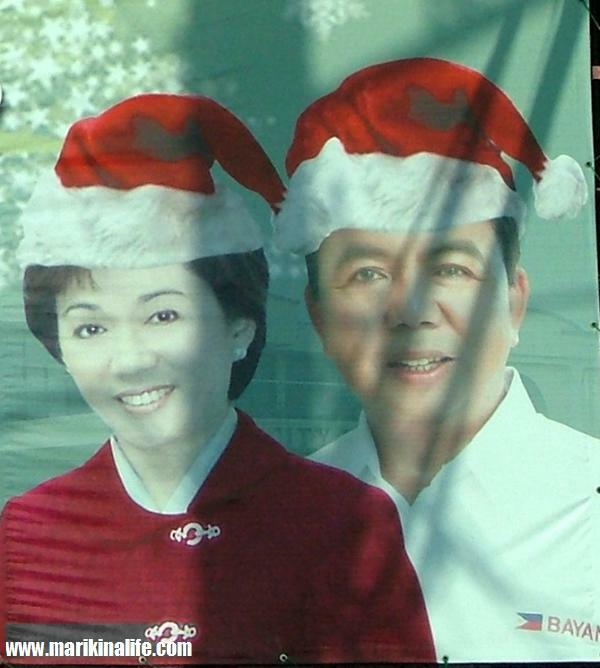 His wife, Marides Fernando replaced him as Mayor in 2001 and was re-elected in 2004 and 2007. Both Fernandos have made a huge impact on the city which enjoyed progress and growth throughout the years. After 18 years of the Fernandos assuming the role of Mayor, Marides Fernando will officially step down this June 2010 as her term ends. Comelec hasn't declared the official winner for the 2010 elections but Congressman Del de Guzman who is running for the position of Mayor commands a good lead of votes. We hope that whoever may succeed the Fernandos will continue to pursue the city's best interests in the name of progress and cityhood. 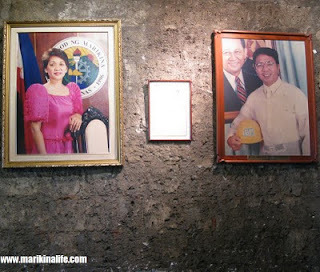 To the Fernandos, thank you for serving Marikina City. To de Guzman, we welcome you as the next mayor of Marikina. 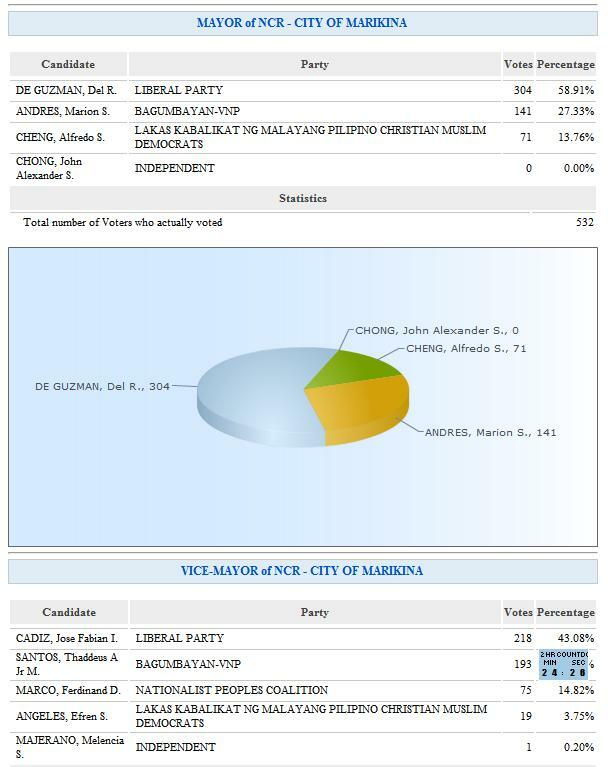 If you want to check out the actual totals per precinct in Marikina City, you can check them out here at electionresults.ibanangayon.ph. There are several precincts listed so you'll have to know your precinct number to view the actual results for your precinct. The results are comprehensive, starting from the President, vice-president, senator and party list positions down to the city level of Marikina (mayor, vice-mayor, congressman, and councilors). Here's a sample for precinct 0004A (San Roque). There are 21 voting centers come this May 10 for the 2010 Philippine National Elections. 1 San Roque - San Roque Elementary School, Shoe Ave.
2 Calumpang - Kalumpang Elementary School, Kagitingan St.
3 Santa Elena - (pob.) Marikina Elementary School, Shoe Ave.
4 Malanday - Malanday Elem. School, Malaya St.
5 Santo Niño - Sto. Niño Elem. School, Agricultores St.
6 Jesus De La Peña - Leodegario Victorino Elem. School, A. Bonifacio Ave.
8 Tañong - Tañong High School (formerly Tañong Elem. School), Lopez Jaena St.
9 Barangka - Barangka Elem. School, A. Bonifacio Ave.
10 Industrial Valley - Monte Vista Multi-purpose Hall, Aguho St., Monte Vista Subd. 11 Industrial Valley - Nativity Of Our Lady Parish Multi-purpose Bldg., Major Dizon St.
12 Industrial Valley - Industrial Valley Elem. School, O. De Guzman St.
13 Concepcion Uno - Concepcion Elem. School, J. Molina St.
14 Tumana - Marikina High School Formerly Part Of Concepcion Elem. School, F. Torres St.
15 Tumana - H. Bautista Elem. School, J.p. Rizal St.
16 Concepcion Dos - Sss Elem. School, Lilac St.
17 Marikina Heights (Concepcion) - Marikina Heights Elem. And High School, Champagnat St.
18 Parang - Parang Elem. School, P. Paterno St.
19 Fortune - Fortune Elem. School, Santan St.
20 Nangka - St. Mary Elem. School, Concepcion St.
21 Nangka - Nangka Elem. School, Twin River St.
To find out which precinct you are assigned to, you can visit, http://www.findyourprecinct.ph , type in "Marikina" (City Of Marikina, National Capital Region - Metro Manila will appear) and select that as your city and enter your precinct number. Your precinct number is found on your Voter's ID. A map will appear with the actual voting center mapped and tagged for easy directions. To know which precinct you are registered in, you can use the Precinct Finder online tool located on the Comelec Official Website. Enter your name, age and it will retrieve information about your voter's registration including your precinct. Exercise your right to vote and choose the best candidates you think will continue to maintain Marikina City's top-notch status. For a list of candidates running in Marikina, check this out. TRASH to CASH is a program that SM City Marikina holds every first Friday and Saturday of the month. "Reduce, Reuse and Recycle" is SM's slogan as initiative for environment preservation. Trash To Cash will be held on May 1 (Saturday) and 7 (Friday) at the SM City Marikina Open Parking A from 8am - 2pm. Part of the proceeds will be donated to various environmental causes.